Okay! Musume Time: S/mileage - Let The Skirts Fly! There are New Members! S/mileage - Let The Skirts Fly! There are New Members! By the power invested in Tsunku, S/mileage has new members! Out of the 12 finalists, 5 were chosen. Two for which are eggs, whilst the other three are newcomers. So, who are these charming new S/mileage members? The oldest of the five newbies, Kana is the charming 14 year old with a cute and warm smile, a person who will make you happy when you look at her. Already I like this girl - I think she is extremely cute and she seems to be elevated at the fact that she's in S/mileage! I can't wait for her to appear in the new single, and I hope that in the future, she becomes an official member! According to various blogs, Kana couldn't sing during the auditions - I have only watched a few clips of the auditions, but really, in S/mileage I think their main point is their cute charm and not their voices. I'm not fond of Dawa's voice or Yuuka's. Anyway, these girls are idols! They have to work on other things that aren't just about singing! 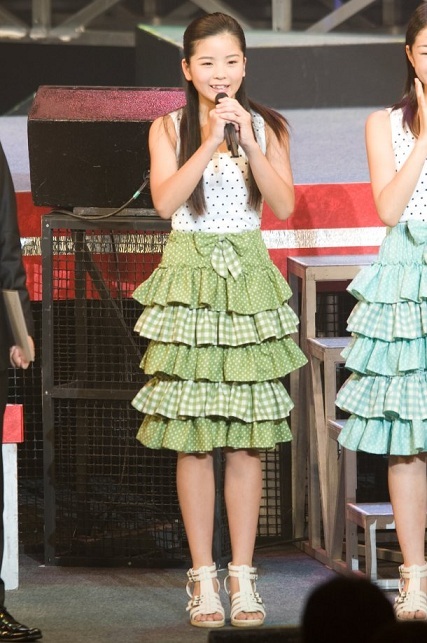 So no matter what, I want to support Kana as she tries to climb the S/mileage ladder in her mini skirt! The intelligent and mature looking Fuyuka is the second oldest new member of S/mileage and the Dawa Look-Alike (as my sister said upon seeing her). Fuyuka is a cute girl who has a great smile and probably an even greater personality - I think that she looks like a true S/mileage member, and I can't wait to see how she looks in the upcoming S/mileage singer and to see how she sings and dances! The popular Egg member, Akari-chan, is the third oldest member. I'm not at all surprised that Akari was picked, to be honest - a lot of people wanted her in, and from her vocal and dancing talent, it was right to pick her - I am also glad that an Egg is in here, because S/mileage was made up of Hello Pro Eggs, so it is nice that they are returning to their roots. Out of everyone, I would like for Akari to become an official member the most. She has worked hard, and she looks the part. I will be rooting for her! The cutie Pie Egg, Rina-chan is the 4th S/mileage sub member to be chosen! This smiley girl is a cute-voiced S/mileage lover and seems to fit the cute image of S/mileage well. Though I don't really care for her as much as I do Akari or Kana, I hope that she works hard, and I can't wait to see her in the PV with S/mileage! Let's hope that she gets in! The youngest member, Meimi-chan! This cute little girl was a fan favourite, so I am guessing that a lot of you are happy she got in? Whilst I am glad she got in, she is actually my least favourite member. Something about her just doesn't click with me, and I don't think of her as a S/mileage sort of character. However, that can all change over time, considering how I didn't like Zukki much and now she's pretty much one of my all time favourite MoMosu members! So, let's wish Meimi luck! So, welcome, new S/mileage Sub Members! For now, these girls aren't official members - they're gonna have to go through a few trials to see if they can be in S/mileage first. Much like the original S/mileage members, they will have to face a few obstacles that are in the way in order to become official members of the group. I think that this is a really good idea, honestly, because it will put the girls to the test and we will see who is the most suited for S/mileage. Whilst others may think 'I don't want them to fail!' I think that it would be good to see the outcome~ I want to see who comes out top. I would love it if two of these girls made it in, mostly Kana and Akara, because I would like to see a fresh face in the group as well as another Egg. But there is something niggling me at the back of my mind as well as the thoughts about who will get into S/mileage as an official member: Will Tsunku take out one of the original four? Tsunku has said before that he will either add or take away members - so what is stopping him from doing just that? It may not be the fans cup of tea, and if he does do that, he may actually break S/mileage's popularity - but he could also make it sky-rocket. If he did just so happen to take away one of the original members, would he make her a soloist, or put her into another group? I love S/mileage as they are, and adding new members is okay, but I would prefer that Tsunku had kept that in the Morning Musume group and not taken it to S/mileage - however, it is his decision, and as much as I hate to say it, the MAN knows what is the best for the group, and it seems that these auditions were, coincidentally, the best, because it is branching S/mileage out, its giving their fans a chance to become a member and ultimately giving the other Eggs a chance to join a group they idolise. Let's hope that S/mileage find the members that they are looking for!